If you hate body work as much as I do than soda blast or sandblast as much as you can. It saves a ton of time !! I take it to a local body shop, Have had the same guy do all the work since I had it repainted when I was 19. (I'm in my 40's now). Most people have dentists or doctors that they go to to for life, I have a bodyman. I just write a check, that saves alot of headaches. You know the old saying, "Why pay to have it done right when you can F it up yourself for free?"! any more updates? More pics? More updates with more pics? What can I say, you do really nice work. We wanna see more. Hello Everyone - No the car is not done but I am starting back up. I am in decent shape to work on the car right now so with small steps I will start again. The car is actually just about done believe it or not. I need to adjust the front fenders a bit, than run the wires for everything. It took a while to go through the wiring harness as that thing was a mess with the lean burn and all the fixes I have made along the way - I have basically cut out all the un-needed runs. 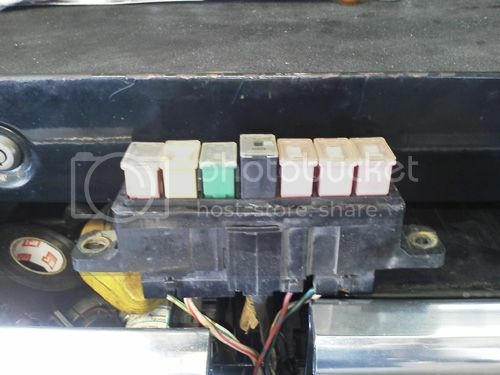 I am going to add a small fuse block I found in the junk yard ( see attached ) and place it along the firewall. This will clean up all the fuse-able links and the crap that is a wiring harness. I will let you know how the fenders go as my plan is to work on those this weeked. Small progress but back at it again. I cleaned the car of all the dust - pulled out the bumpers and misc parts and will try to paint all the little items remaining this week. 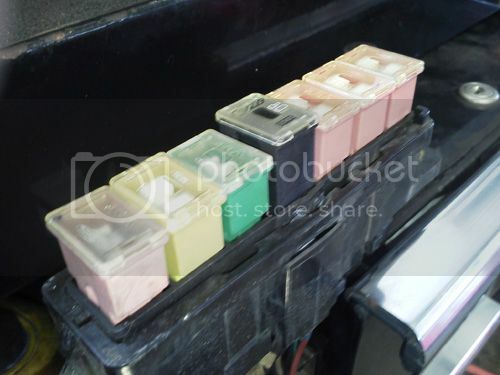 I am missing a battery tray if anyone has one or knows of a parts car that may have one that would be helpful. I am not finding any luck with a replacement at this time. I lined up the fenders this weekend and button the fenders in place. I will run the wires this week and hope to get the car started. I think it would be a good week to get the car started this week but perhaps by next week. The car is not dead in the water just been in hibernation. Thank you for the continuous interest. My hope is to wrap this project up by the end of summer. No new pictures this week yet but I will have something after painting the bumpers. Good Evening- Back at it again. I am going to finish this car if it KILLS me! I have finally given up on certain parts of the car because the body just can't handle the pain any longer - Ha Ha Ha -- Mine that is - The Magnum actually looks great - I am looking for a few items - I can come up with something if I need to but I was curious if anyone out there has already dealt with the same issues. I would like to add the hood insulator back on - Part number 4049601. I would like to replicate the ordinal so if anyone has a line on where I can pick one up that would be great. The other option is I simply have one made and custom print a logo or something on it. I just need to know what material is best to use -I would like black in color not the silver stuff. The other item I am looking for is the door sill or kick plate - part number 3763274-5 with pad 3763255. Again I have the old sills and I can clean them up but I would like something in a little better shape. Anyone ever replaced the door sills - what did you use - where you able to customize the pad? I had to repaint the car after more then a year or sitting around- I did not paint it this time around - that honor was to someone that actually knows how to paint. I am hoping to finally get the car started next weekend. I will keep you posted it the thing actually starts. I rebuilt the engine 5 years ago and never turned it over. I may be in for some surprises. Hey, good to see and hear from you!! i wonder every so often how you're doing. Not sure on the hood insulation, I wondered that myself. I have to believe that it's the same material used on earlier B bodies. I will keep you in the loop when I figure it out. I was not as successful as I would like this week getting the car started. I will figure it out this week. I tried a couple of times without luck so I started under the car. I applied some Por15 to the interior cabin area and underbody. I will try again on Monday to get the car started. I messed up the wiring somewhere. ( aftermarket ) that I can put in? I tried painless performance already - they did not have one. I would like to rip out all the old wiring and re-run all new stuff and eliminate the wiring I do not need since the lean burn was pulled out - any thoughts? Another week down - It appears the water leaks where a little more of an issue. When I had the exhaust put on apparently the muffler shop pull off my headers because they thought they needed to fix or bend the headers a little to avoid the starter on one side and spark plug wires on the other side. They felt I may have done something wrong when I installed them and they needed to fix the problem. In the process they changed the header bolts. The bolts on the back side of the engine ( both sides ) ended up being too long. They busted into the water channel of the cylinder head ( Both sides - back ) . Hence my water leaks. So my joy of finally getting the car started turned into now I need to fix the cylinder heads. Long story short- Out with the old and in with the new compliments of the local muffler shop. Well some of it - the new heads, seals and bolt kit. The rest of it I decided I was tired of messing around with. So with the new - Edelbrock heads part # 60779 , New Edelbrock cam part # 2177 , New Edelbrock performer intake , new MSD coil, distributor, and ignition module. This should cut down on the wires and help with a little more get up and go. I would add pictures but for some reason I am unable to add attachments or pictures. Keeps giving me and error that I am not authorized to add attachments. So until that is fixed not pictures.